For ice coffee drinkers, there are plenty reasons to enjoy a frosty cup through out the day, but there are also some issues. 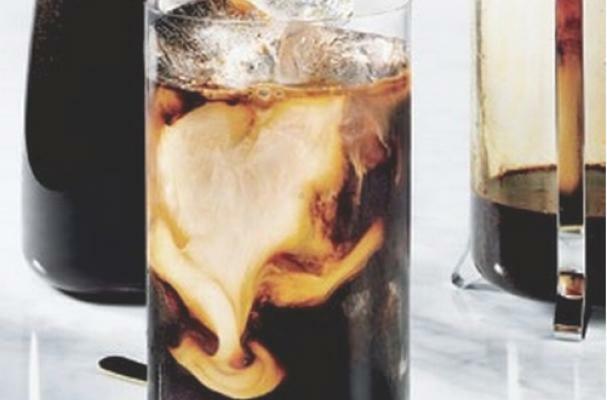 Stomach irritation, bitterness, watered down flavor, are just some of the problems we ice coffee lovers face. The solution? Cold Brewing! Cold brewed coffee is ground beans that never see a drop of boiling hot water. In fact, they are ground and soaked in cold water for an exceptionally long time (15 hours is the recommended period). This results in all the flavor, without a bit of the acid. Even a less than excellent brand of beans will result in a pretty delicious cup of ice coffee using this method. In a large container(I use glass), place grounds and water. To make it a little easier to soak grounds properly, I like to pour enough water over the grounds to make a slurry. This ensures my coffee grounds are all wet before adding the remaining water. Once it is strained, your concentrate is ready, and will last up to 14 days in the refrigerator. Dilute concentrate 1:1 with milk/water/cream, and sweeten if desired. Adjust to your taste!